Speak of the Devil: Equality Gone Too Far, a fundraising event. Proudly hosts Speak of the Devil: Equality Gone Too Far, a fundraising event. Join us for an unforgettable evening filled with sin as well as debauchery! For your entertainment, there will be Live music performances and Raffles with an assortment of prizes to be won! A ritual and flesh hook suspension by Sythe Cruz to stimulate and entice your senses! 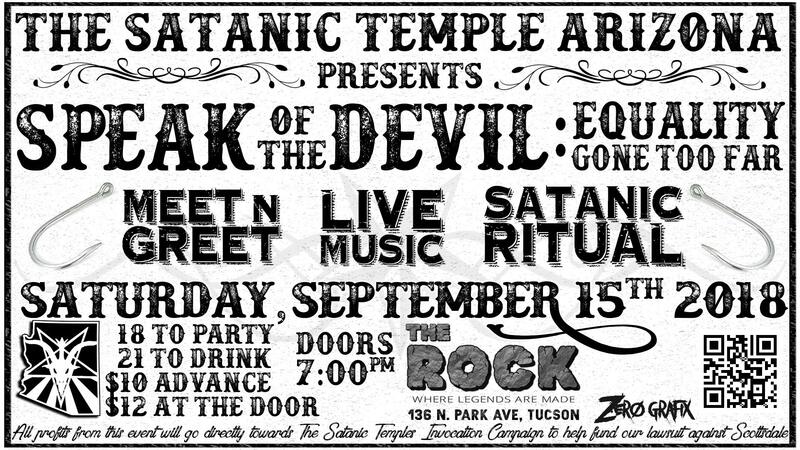 We will have a lecture from The Satanic Temple’s legal adviser Stu de Haan as well as Arizona Chapter Head Michelle Shortt! Decayer, Evasion, Hell Follows and more!